If you are using Android phones and no doubt you know definitely one of the most popular applications .. application of third party WhatsApp + or what is known among users apply and WhatsApp Plus Blue which is owned by one of the developers and offers you some non advantages found in the main application with the ability to more to customize the colors, fonts, backgrounds and notices and Maely it. 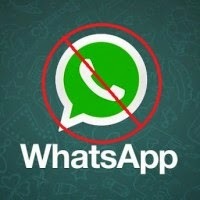 The bad news is that WhatsApp actually began shortly before the ban in the numbers that are used application and WhatsApp Plus for 24 hours, and while it seems that the ban will continue as long as I still use WhatsApp place until you return to the official application. As of the WhatsApp and ban accounts for 24 hours, they should be patient until the end of the period and then do log on through the application and WhatsApp after deleting the original application and WhatsApp Plus. We bring you any updates or comments from the parties to this story later.